WASHINGTON (CNS) — There is no doubt that many who attended the Feb. 3-6 Catholic Social Ministry Gathering in Washington made great efforts to attend, trudging through winter weather in the U.S. and the normal transportation woes that come with long-distance travel. But it would be hard to find someone to match the journey of Adelson da Silva, who goes by the name Kora (pronounced Ko-rah). It took the indigenous leader from the Kanamari community in Brazil 10 days to travel from his village in the Amazon, via foot, canoe, public transportation, boat and finally a plane to reach his destination at the gathering of social ministry leaders in Washington. “It was very hard,” he said through an interpreter in a Feb. 3 interview with Catholic News Service. But the conviction to speak with others who could help, not just his community in the Javari Valley of Brazil, near Peru, but the earth itself, fueled his strenuous journey. 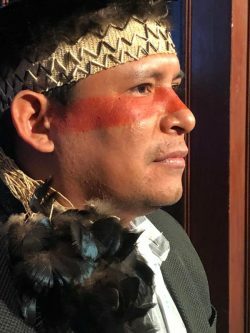 At the gathering in Washington, he voiced the concerns — environmental, cultural and spiritual — affecting his and other indigenous communities of the forest in Brazil. The Catholic Social Ministry Gathering is organized by the U.S. Conference of Catholic Bishops’ Department of Justice, Peace and Human Development in collaboration with four other USCCB departments and 16 national Catholic organizations. Kora pleaded with Catholics gathered for the event to help fight for suffering indigenous communities such as the Kanamari, for clean water and air, and for the earth itself. During some sessions, he warned the crowd that rich and poor will suffer, if humans keep on the path of destruction that has altered the cycles of nature that the Kanamari people and others can see so clearly. The Kanamari have firsthand experience with the interrupted patterns of nature signaling a bigger problem ahead, he said. Signals that told them when to plant and when it would rain have disappeared. It’s hard to tell when it’s winter, when it’s summer. It affects the Kanamaris’ food supply, but also their culture, he told CNS. Their community activities, spiritual activities revolve around these cycles. While many do not consider man-made interruptions to the planet their problem, it is, he said. It’s not something that will be contained in the Amazon, or solely be a punishment for the poor. Destruction of the Earth means destruction of all, he said. Pope Francis’ help in disseminating this message is important, he told CNS. “It’s an intervention that sheds light on the imbalance of nature and it gives great force and support to our indigenous people,” he said. While not many indigenous communities, including many who have little or no contact with the world outside, know of the pope, Kora’s community, the Kanamari, know about the pontiff’s efforts when it comes to raising awareness about the plight of the earth. Some of them consider Pope Francis “like a Kanamari chief” because of his vision to call for the protection of the earth, he said. While the Kanamari belong to organizations that help them voice their concerns, the “pope’s strength (and global reach) does a lot in terms of integrating indigenous people with non-indigenous people,” and unites both in the battle for the protection of the earth, he said.